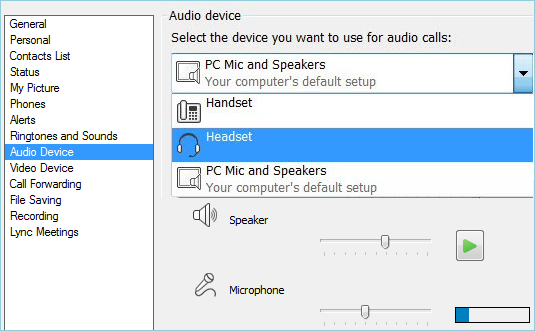 You can set up and use your computer’s built-in mic and speakers, a headset, or another device for Skype for Business (Lync) audio. For the best audio quality during a Skype for Business (Lync) Meeting or call, use an Optimized for Skype for Business (Lync) audio device. Note: If you’re using Skype for Business (Lync) with Windows 8.1, make sure to update your device drivers to the latest version. See Download and install drivers for Windows 8.1. In the Skype for Business (Lync) main window, go to Options > Audio device, and then choose the device you want. Click the green arrow next to Speaker to hear a sample tone, and drag the slider if you need to adjust the volume. To test your mic volume, speak for a few seconds. The volume is optimal when the progress bar reaches the middle of the test area. Drag the slider next to Microphone to adjust the mic volume. Click the green arrow button next to Ringer to hear a sample ring when you get a call, and drag the slider to adjust the ringer volume. Click Check Call Quality and follow the prompts to record a short message and play it back. Adjust audio as needed. Note that this option may not be available for your account. If you have more than one audio device, you can choose to set both to ring when you get a call. Under Secondary Ringer, select Also ring, and then select an additional device. You can also select Unmute when my phone rings, which will automatically unmute your speakers when you receive a Skype for Business (Lync) call. Select Allow stereo audio playback when available to make sure that the best audio quality is available during a meeting. Tip: You can select different devices for microphone and speakers under each section. But to avoid echoing, it's better to use the same device for both. If you have to use separate devices, minimize echoing by lowering your speaker's volume. If you don’t see your device in the list, make sure it’s connected directly to your computer and follow the instructions that came with the device to install it. If you’re not able to set up your device, see the troubleshooting topic. For a quick workaround, call into the meeting with a phone. See Call into a Lync Meeting.